Provincial Comitium (Tarraco), at Tarragona. It should have been built ca.70, at Vespasianus Emperor Age. One of the greatest Comitiums -almost 8 Ha.- from Roman Empire. Doubtless, it is, indeed, one of the best documented. The reason for building it was getting a big center for social and political administration of the capital of a big province, that included more than 300 cities and have to lodge its rulers, becoming the Concilium Provinciae Hispaniae Citerioris. City was developped on two terraces conditioned to the land's orography. There are well preserved remainings of structures and some decorative elements. They let us imagine the high position of this city inside the whole Empire. Probably, materials, workers and architects were born at Rome itself. It is a pioneer city building temples for Imperial use that would be necessary for all Hispanic cities Corduba, Emerita Augusta. 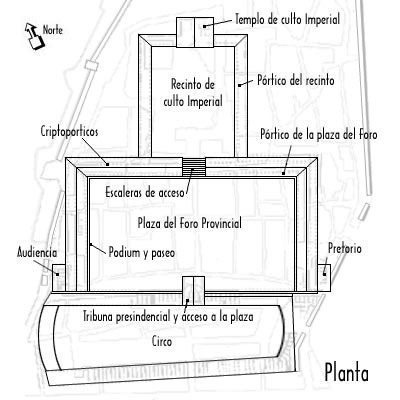 This area for Imperial worship, placed on the superior terrace was composed by a rectangular square surrounded by a portico with columns of composed capitals. They were 150 m. x 130 m. Access was made from central square of provincial Comitium, through a staircase. Temple for Imperial worship was placed at the bottom of this portico: at its center. It was octastyle -eight columns at the façade- and was 24 m. wide. Elevation of the square for Imperial worship with the temple on its center. Second terrace was occupied by the Square of Provincial Comitium. Its northern part was communicated with the Imperial worship area; southern one with the circus through a staircase that gave access to the different levels of each terrace. Communication with circus was indeed covered by its presidencial tribune. This square is also rectangular: 320 x 175 m. It was limited by a portico on a podium of alsmost 4 m. at three of its sides. Its wooden cover was supported by a wall with Doric pillars at its inner and columns at the exterior part. Inner wall with included pillars was an exterior wall of ashlars supported by vaulted chambers -cryptoporticos- surrounding the square by three sides. Section of the portico at the Square of Provincial Comitium. At both ends limiting with the circus, there are two towers communicating with different levels of circus and square. Both towers are preserved today: the western tower Old Audience and the eastern one: Palace of the Pretorium. This building, also known as Pilatos Tower, is a construction with a rectangular plan. It is 30 x 25 m. It is the tower that communicated through corridors and stairs -with the shape of a u- different levels from circus and comitium. It was not too high: 22 m. just to serve its function. It was divided into two sections: one with three plans and terrace and other just with two. It has been built with big rectangular ashlars well carved -opus quadratum-. 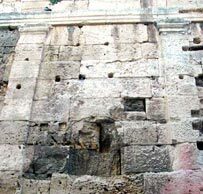 5 first meters high from Roman facture do remain: upper part, built as the Roman one, shows a Medieval facture. 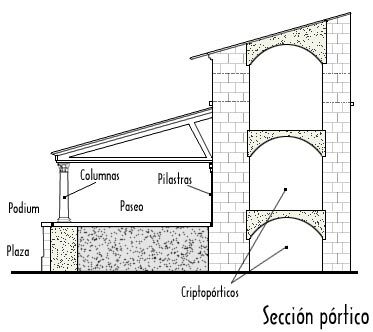 On the upper plan, at its comitium façade, there are doric pillars surrounding inner wall of the square portico. On these floors there are several doors with lintels or semicircular archs. As it was used at the Middle Ages as a residences for Kings and Nobles, it was seen as a Roman palace, though it never was so.